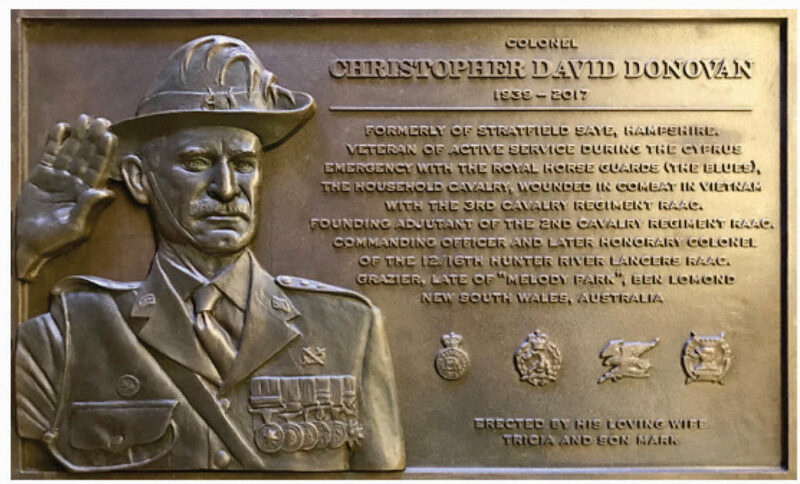 Since 2017 I have been filling my time between making small maquettes and large monuments by creating portrait plaques. This all started when I got an email from a woman in Southern California who lost her son and wanted to honor him with a bronze plaque. She had seen some of my reliefs on the internet and had decided to reach out to me. 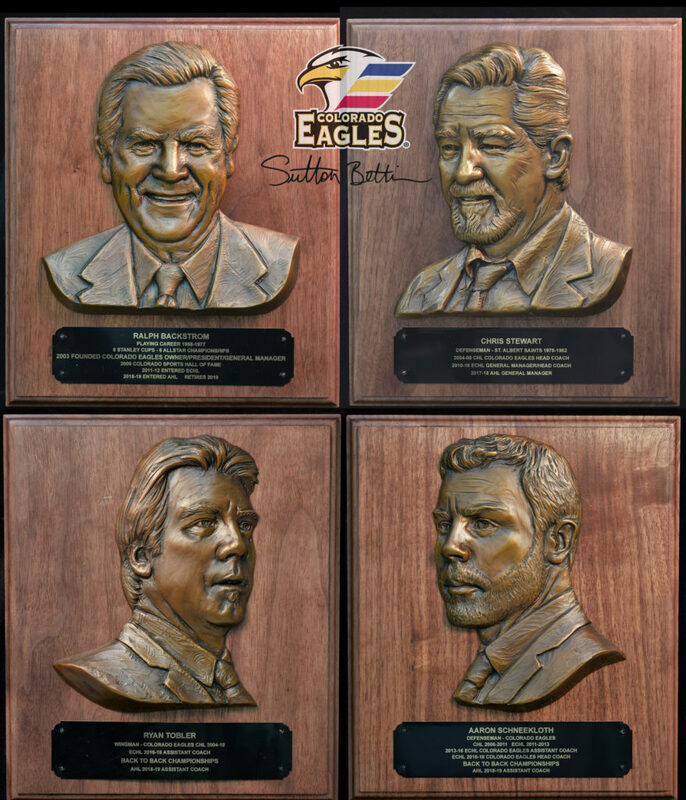 And so began my journey creating bronze portrait plaques. Although I had been sculpting in relief for many years I had only started to really “get it” in 2011 when I began pushing the boundaries with what I thought possible with relief. Most of this new discovery was playing with techniques I’d learned from when I was learning painting in art school and applying them to relief sculpting. When sculpting in relief you are dealing with such a flat surface that the differences between 1/16 of an inch or less can make or break a likeness. There needs to be a steady hand and a critical eye and for the 6-8 hours it takes me to sculpt a likeness I am fully focused on the task at hand. No phone calls, no internet time, very little interruptions and full throttle on the challenging task at hand. There are many little tips that one day I will teach to those interested in learning. But, in short, good relief work is done from practice, practice, practice. In late 2005 I made the decision to move from beautiful Santa Barbara, California to be in the well known arts community of Loveland, Colorado. I had visited Loveland a month before deciding to move here and I immediately fell in love with the Colorado outdoors, the smiling faces (something that is a rare sight in Southern California) and importantly the close knit and well known sculpture community that is Loveland. I continued doing work for a sculptor in California by creating clay sculptures in Loveland and delivering the originals to her home in Santa Barbara (yes, that was a long long drive). But this quickly got to be a difficult working relationship and so I had to say goodbye and I began to look for work in Colorado. My very first job was helping a sculptor finish a large scale monument that the artist had been working on for 14 years!! 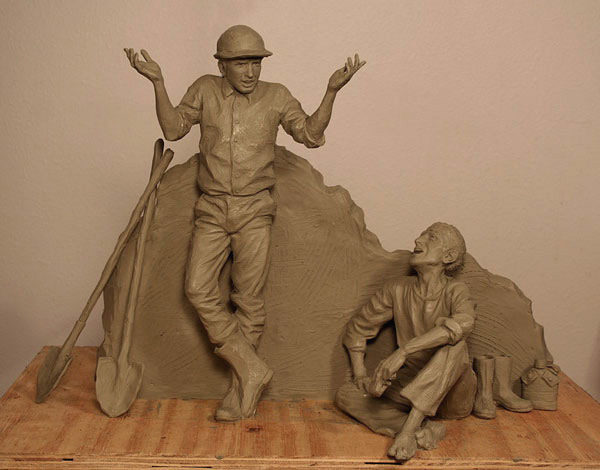 I then found work as a lead sculpting assistant in downtown Loveland for a well known sculptor. For the first time as an assistant I was responsible for just about every task in an artists studio; clay enlargement, mold making, wax pouring and chasing, welding, metal chasing, patinas, keeping the shop clean, meeting and greeting clients, mold storage count, making sure the swamp cooler worked properly for the upcoming hot season (which in Colorado is nothing compared to where I was from). Although the pay wasn’t very good, I took tremendous pride in my work and the opportunity to learn so many aspects of bronze sculpture. I was very happy. Although I had been working as a sculptor’s assistant in California for different artists for about 9 years, I had not been trained in so many different aspects of the business until moving to Loveland. This was an experience that was fairly new to me and I fell in love with sculpture all over again. Within 2 years of working in Loveland I was handed an opportunity for a public art competition by my boss. 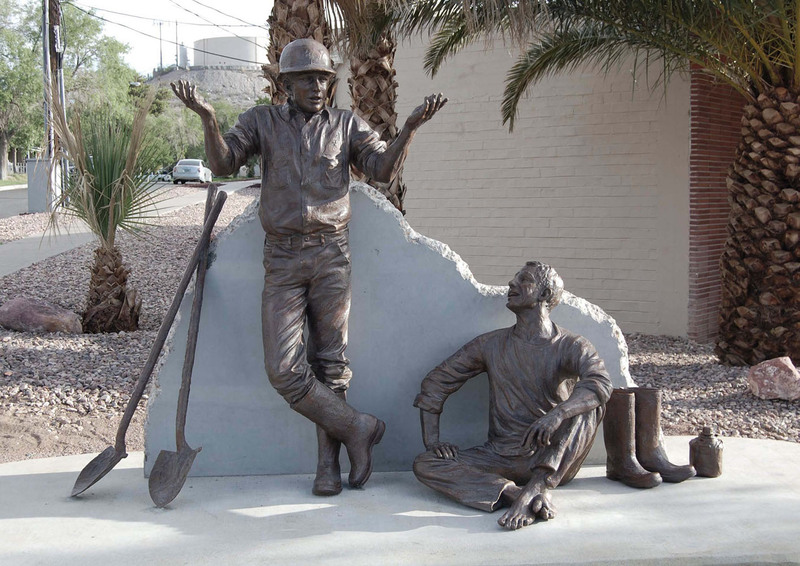 The city of Boulder City, NV was looking for a life size bronze sculpture that could tell a visual story about Hoover dam. The sculpture would be a part of their collection of public art relating to Hoover dam. I took this opportunity to heart and researched my next sculpture. I posed for photos myself as I couldn’t afford a model and created a small maquette that I titled “Puddler’s Lunch Break”. The sculpture was designed to break the myth that workers were buried alive during the building of Hoover dam, which was only a myth. Two “puddler’s” are on a lunch break exchanging stories and the message that I hoped to get across was that although Hoover dam was built during the Great Depression, these two men were happy because they had work unlike most people during this time. The small sculpture landed me my first life size outdoor commission. Something I had been trying to do for the past 9 years but to no success. Since my first commission in 2008 I have had many highs and lows of being in business as a sculptor, but I have ALWAYS been grateful for this community. The openness of artists and crafts people that are here has been an absolute treasure that makes this town unique. There are three foundries within 10 minutes of each other and a handful of “independents” that specialize in each step of the casting process. I know just about everyone of them and have given just about every one of them work. Everyone I have encountered and worked with has been tremendously supportive and helpful. It is a town that has art pulsating through it’s inner veins and it’s unique history as an arts destination makes it one of a kind throughout the world. A place like no other because of the people that are here. The artists, the foundries, the craftsmen and women, the lovers of art and the younglings who aspire to be an artist. It is this attitude and uniqueness that was shown to me when I first came here and I hope that Loveland, Colorado continues to be the unique arts community that most people know and love for many years to come. “Puddler’s Lunch Break” maquette was my first winning design that got me going in public art sculpture commissions in 2008. Puddler’s Lunch Break was designed to help break the myth that workers were buried alive during the building of Hoover dam, but this would have been impossible due to the manner in which it was built. #whatsallthefussabout? 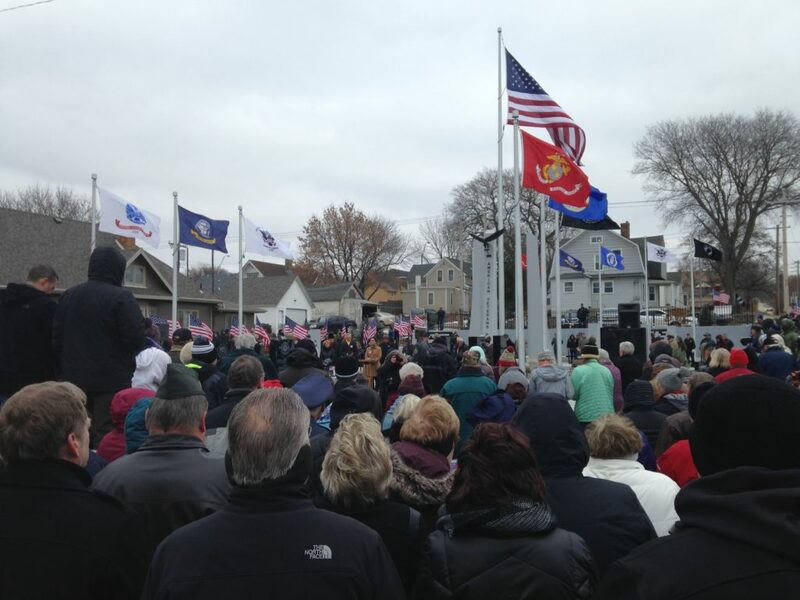 Last month on November 11 we unveiled American Veterans Park in West Point, Nebraska. Lieutenant Governor of Nebraska Mike Foley was there, as were hundreds of people that braved the cold, including my mom, step dad and brother all the way out from California. The park is still not completed as we are waiting for funding for the last 4 statues, two life size statues and two large scale reliefs. Even without the final sculptures plus a few granite columns, the site was very well received. This site will be, for the remainder of my life, one of the highlights of my sculpting career. When it’s all done there will be 10 of my sculptures permanently installed here. There is also a couple of small details that were included at the site in my dads honor that I will cherish for a long time. 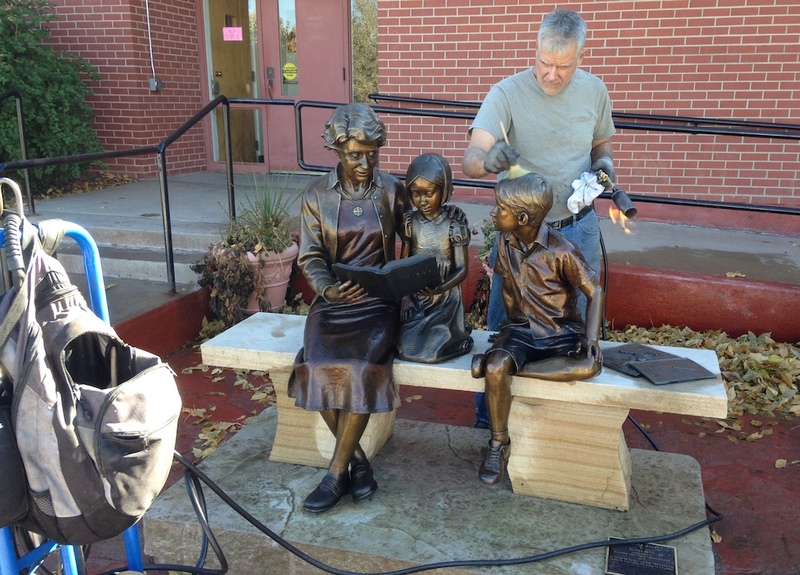 Today, Dave Dedecker of Sculpture Services of Colorado power washed and hot waxed two of my sculptures in Fort Collins and Loveland, not too far from each other. Master Swimmer is located at EPIC in Fort Collins, Colorado and Sowing Seeds at Mountain View Presbyterian Church in Loveland. It is recommended that every year or two a good cleaning and wax is applied to outdoor sculpture, depending on their location to renew the sculptures to their original look. Over time the wax will thin out exposing the lacquer and patina surface of a bronze, which if gone uncared for any further will begin to oxidize the surface of the bronze. Today, with the weather warming up to the mid 60’s it was a perfect day for some TLC. 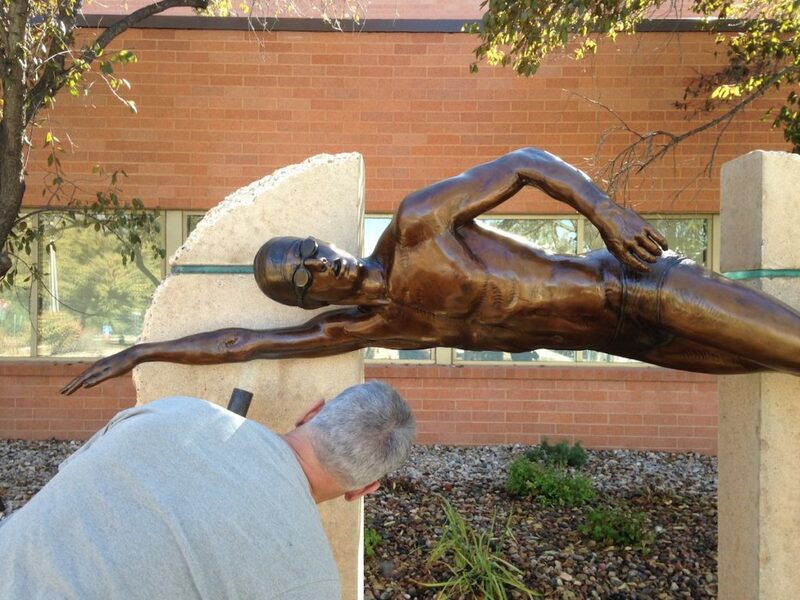 Recently I returned from Nebraska where we installed my sculpture “Returning Home”. 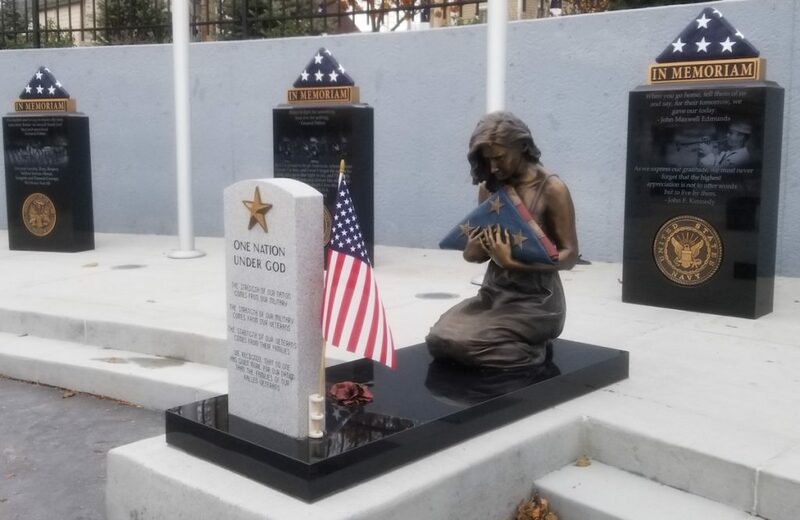 I also set up a donation booth during the Last Fling Til Spring car show at the entrance to American Veterans Park with my life size Gold Star Wife and Remembering. The intent was to help raise money for the final stage of the park in which I have two more statues to make and two large scale reliefs. I was fortunate to have some help manning the booth as there were a lot of people at the car show and I got to meet some really neat people. One of the more challenging sculptures I’ve created is finally completed and ready to be installed. Returning Home required many hours of research into many areas, including desert camo uniforms, patches, folds of different fabrics, compositional balance and how a “jump hug” should look when a child is also hugging you. Now that the sculpture is done, I can look back and say yes, how much time and effort one puts into research can equal the success of a work of art. For me, Returning Home is a success. Of course, you have to apply the research and not skip over little details. But generally, if you have a good idea with a generally good composition, the artwork can be made really good with attention to the little details. For example; the US flag patch on the mans right shoulder. Seems like a small detail (and it is) but it is a really important one. I learned that the flag appears backwards on his right shoulder because it is important that the stars (and therefore the flagpole) face forward. This shows that the soldiers are going into battle. How? The idea that when you are walking or running towards the wind, it is assumed that you are going into or facing a challenge. And if you do this holding a flagpole, the stars would be facing the direction you are going as they are the closest to the pole. If the stars face the opposite direction, it would symbolize running away from or in the opposite direction of the wind (assuming the wind speed is greater than the running speed). 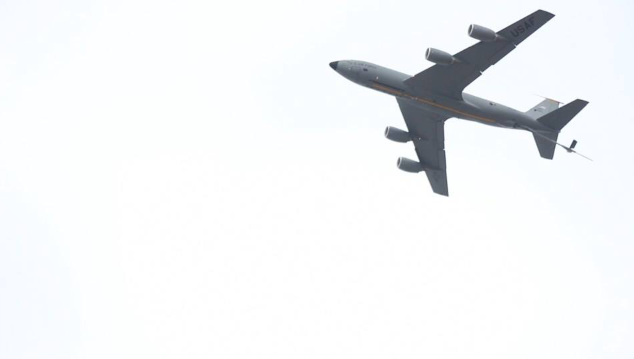 So if a US flag patch were worn on the left shoulder, as compared to the right, the stars should be facing the left side of flag and front of the soldier. So in short, this flag patch is meant to be worn ONLY on the right shoulder. The little details, such as this, may seem small, but when you are working on long lasting, bronze sculpture, details go a long way. There has been quite a bit going on in my studio these days, but there is light at the end of the tunnel. 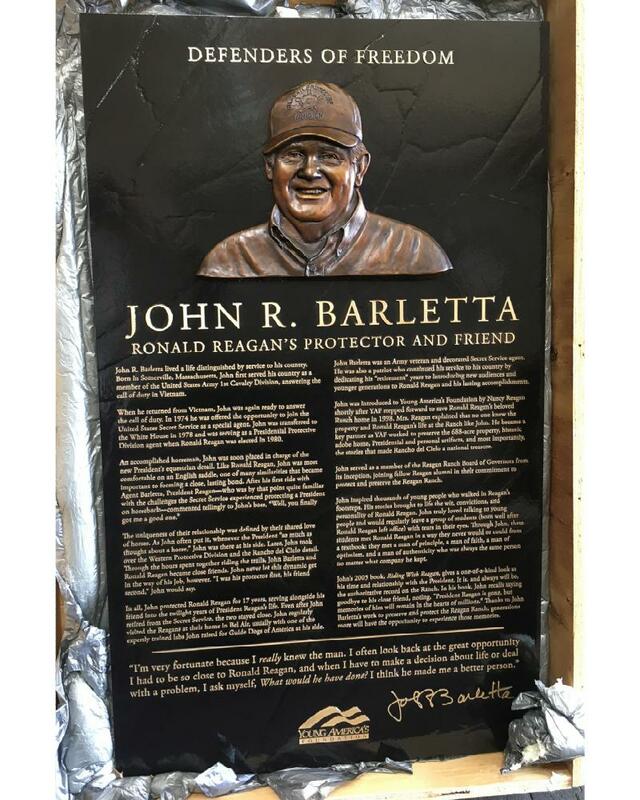 One of the projects I finished recently is this 43 inch tall bronze plaque for the Ronald Reagan Ranch in Southern California honoring the late John Barletta. Barletta was a former secret service agent under President Reagan and the two remained close friends throughout Reagans post-presidential life. Following the passing of President Reagan, Mr. Barletta worked with Young America’s Foundation (who purchased the 688 acre property in 1998) in preserving the Reagan ranch and educating the youth about his friend and the 40th President of the US. 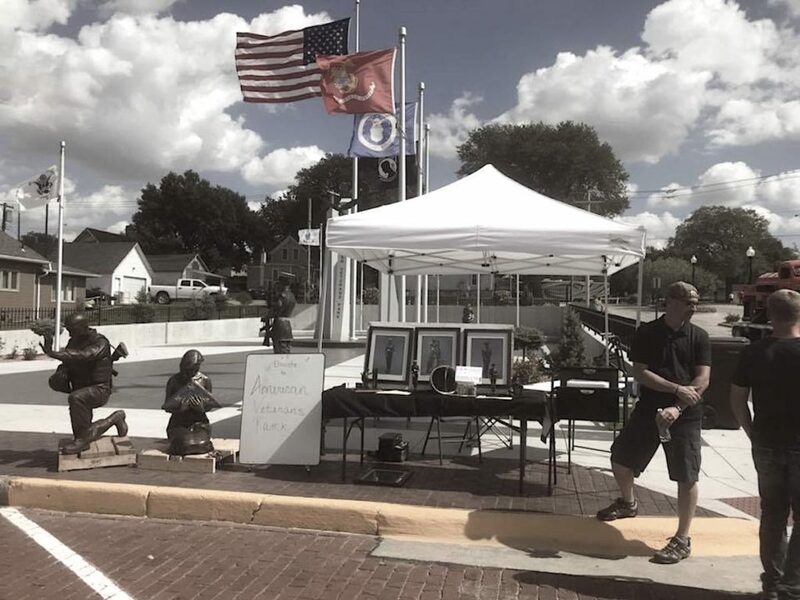 For the last few weeks, all twelve of the sculptures that are going to be installed at American Veterans Park in Nebraska were in danger of becoming a french brown or black patina. These sculptures were all designed to have some color in them and a brown or black patina would have gone against my original designs and diluted the meaning of many of the sculptures. Over several meetings the design committee was split evenly, half of them were for it and the other half were very vocally against it. I was not in these meetings, but last night I was asked to write a letter that explains why I would choose the colored patinas on these military sculptures for a meeting the following day. The committee was going to be absent one person who was pro-color so I needed a miracle. Below is what I wrote to explain why I wanted color in the sculptures. I have been aware of the discussions regarding patina choices on the AVP sculptures and I would like to express my thoughts on why various transparent and opaque colors were chosen in the designs compared to a traditional french brown or black patina. #1 Although each sculpture might have a color that is different than the sculpture it is next to, it is important for each sculpture to be seen independently and not judged on cohesiveness as a group. While the entire design of the park will be viewed as one whole, those individual elements themselves (concrete, granite and bronze) should not be. For example, there are two colors of granite in the park. Is that a bad design? Should ALL of the granite and concrete be one color? I think all of us agree that it should not. Comparitively, by lumping all of the individually designed monuments into a similar color or tone will greatly affect the uniqueness of each individual sculpture. For example, present arms, Marine will look too similar to the present arms, Army. This will take away from the unique 4 generation gap. The color difference on these two sculptures, in my honest opinion, helps people to see the two statues for what they are and invites them to spend more time in the park. I am aware that having some form of consistent color is the topic of discussion. However, I believe that what would make AVP unique among the other veteran parks is not how much the statues look like each other, but how much individuality and power each one has. People connect with color, so lets use color where we need to to help communicate our message. 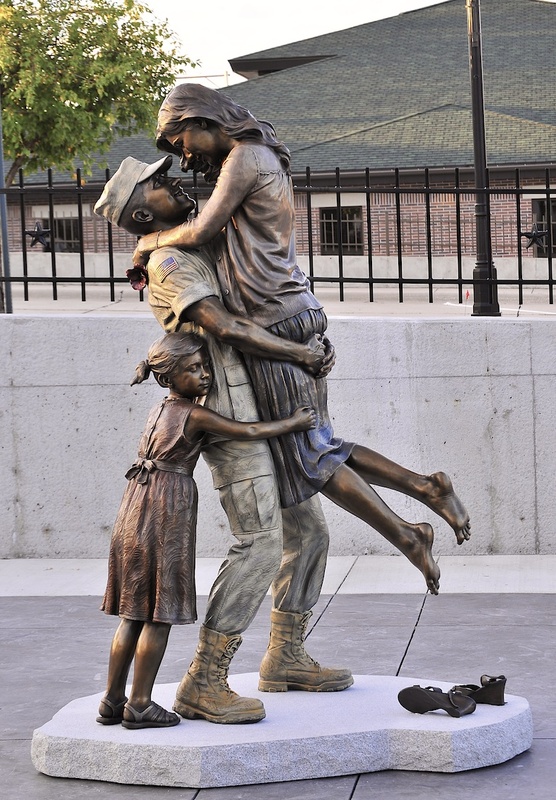 Returning Home (life size) was designed for American Veterans Park in West Point, NE to be one of two sculptures that tells the story of love and loss. 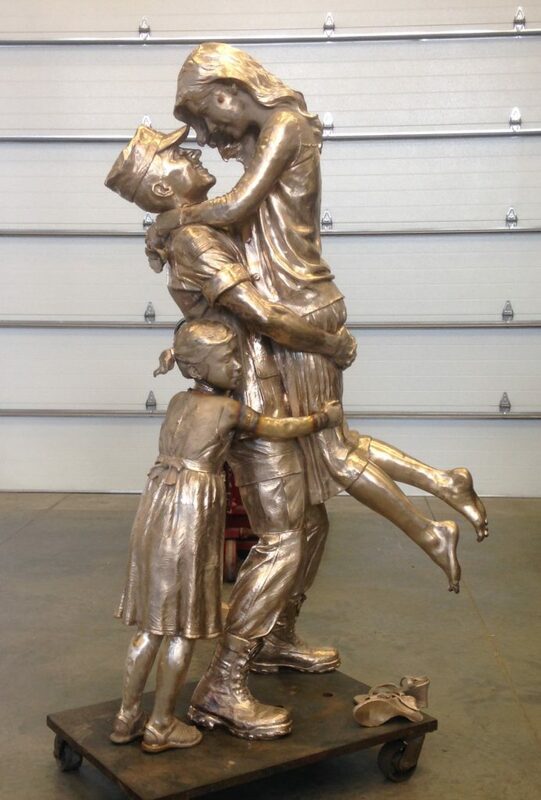 While this sculpture tells the story of love of family, Gold Star Wife (not pictured) tells the story of loss. 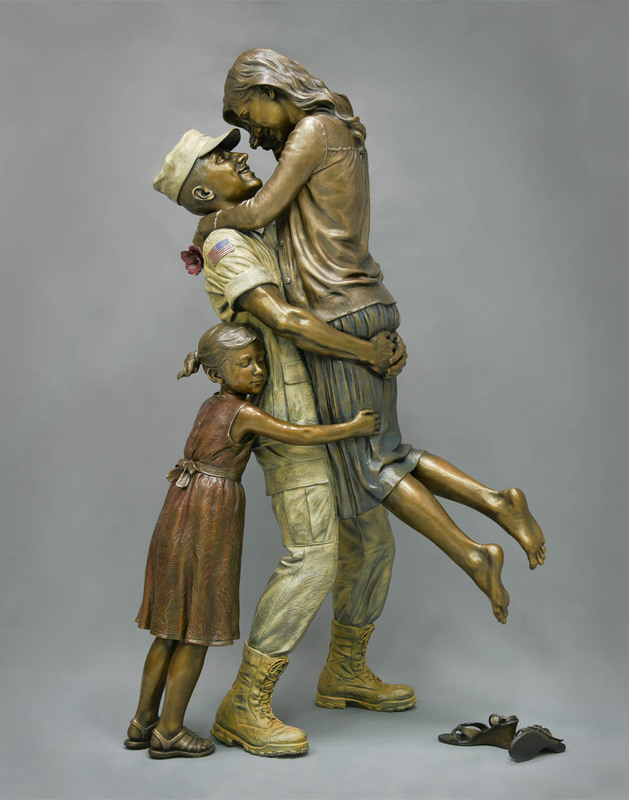 A complex, three figure composition Returning Home shows the moment the husband has come home from war and is embraced by his family. 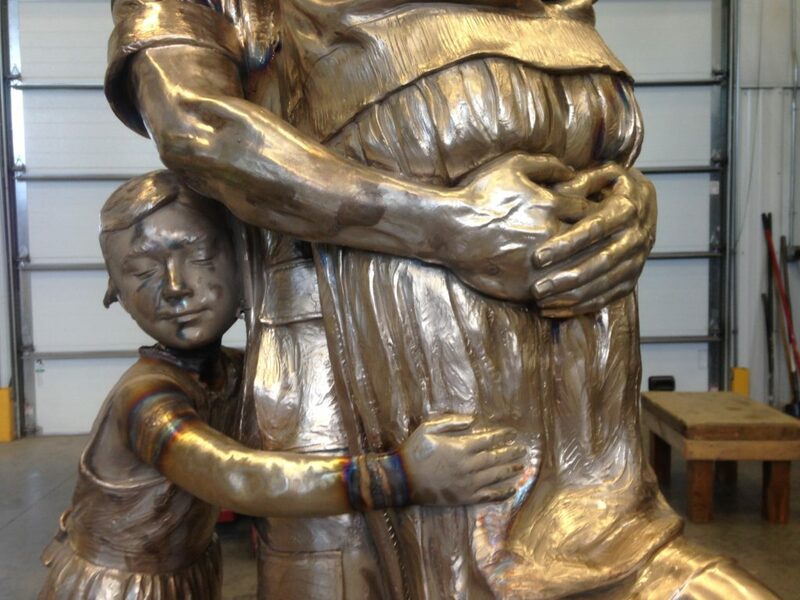 They are hugging each other and the sculpture is supposed to evoke the feeling of what it is like for military families that have to endure separation and uncertainty. With this sculpture I had an opportunity to apply what I’ve learned over the years regarding composition. When I compose a sculpture I am always conscious of how a viewers eye is lead from one section to another. With most of the single figure sculptures it can be difficult because you are dealing with one body only. In this sculpture, however, I had the opportunity to have a unique visual focal point; the gaze between the man and woman. When we first look at the sculpture our eyes immediately go to their faces, first the woman, then the man and back and forth a few times (hopefully). After a few moments ones’ eyes are then directed downwards towards the little girls happy embrace. The cascading arms help to lead the eye down towards the girls face to see that her expression, although different, reflects the couples smiling faces. Then our eyes move back up towards the main focal point or around to various smaller focal points, such as the hands located throughout the sculpture or the poppy that the woman is holding. In most of my favorite sculptures of historical importance there is one other element that might seem insignificant, but in essence is really important for making a work of art easy on the eyes: having a visual element that leads the eye OUT of the artwork. That is so the eyes, and viewer, can leave at anytime, although they don’t have to. This might seem counter-intuitive to have a place for people to be able to exit the sculpture. But I think of this as like going to a party (at least for me). Imagine you were immediately transported to a party where you knew no one. It would seem that they are all wonderful people but there is one thing that would really put your mind at ease and possibly even make you feel more comfortable. Knowing where the EXIT DOOR is. Whether consciously or subconsciously you would probably immediately look for a door if you were suddenly transported there. In my mind, the same thing happens with artistic composition. While having a well done focal point is probably THE most important part of a design, you also need a place that provides a safe exit. And, on Returning Home, this place of visually exiting the artwork is through the woman’s two feet. They are pointed away from the sculpture and down towards the separately casted heels, breaking the circular composition throughout the sculpture. This is communicating with you, visually, that you are welcome to leave at anytime. But, of course, I hope that you will stay for a while. The bronze casting of Present Arms, Army (photo) is currently being assembled by the skillful team of Palm, Inc. in Loveland, Colorado. The 200 lb. 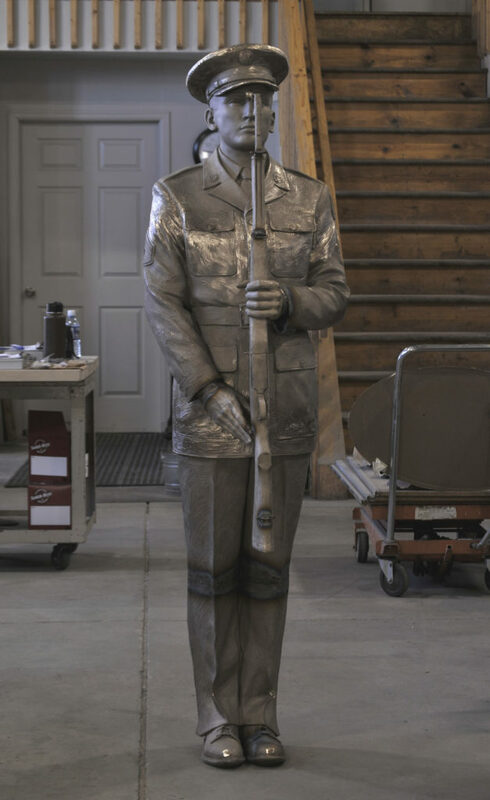 bronze casting is 5’10” tall and this sculpture will be permanently installed next to a US Marine Honor Guard for a Veterans Park in Nebraska. Present Arms, Army is a WWII era US Army Honor Guard who is holding an M1 Garand rifle. The sculpture was modeled after a WWII Veteran named Harold. I worked hard to capture Harold’s likeness but I was also concerned with making sure that the sculpture would look like he was pulled right out of the 1940’s. Therefore, it was important for me to study some of the illustrations from that period and one artist in particular became very useful, J.C. Leyendecker. Leyendecker was famous for his illustrations for the Saturday Evening Post and is one of my favorite illustrators from the Golden Age of Illustration. What he excelled at and was known for was his unique depiction of the male figure. Whether it was an athlete, a business man or a soldier, a Leyendecker Post cover represented American standards of beauty.